Still cloudy in the morning. I did manage to dry laundry outside, but couldn't see the sun at sunrise. But it was my last chance to get a pix even close to the equinox, so I took it. As a reminder, these are pictures taken from my kitchen step at or soon after sunrise. I try to take them on the solstices and equinoxes, but what with clouds and my affinity for midnight rather than dawn... let's just say that one should never try to make a calendar from my findings. Anyway, this time I thought that I would shrink the previous pix and stack them with the red line, which is just for orientation... it goes through the same tree in each one. The dates are: top to bottom, Sep 24, 2009, Jun 24, 2009, Mar 23, 2009, Feb 17, 2009 (not even close to the winter solstice), and a year ago... Sep 21, 2008. Now you can easily see how the sun wanders north and south from where it rises on the equinoxes. So, I'm off in the morning. Couldn't get a contest together for this month. Couldn't get any posts done ahead. I'm really hopeful that I'll be able to post from the hike a few time. For some good reason, views on this blog have increased since I came home from the Minnesota hikes, so I am really sorry that the regular posts will be on hiatus so soon again. Thanks so much, everyone! The hawk wins for today's post! It was gray all day... maybe I can get the Kitchenhenge picture tomorrow. It's clear outside now. It will only be 2 days off. 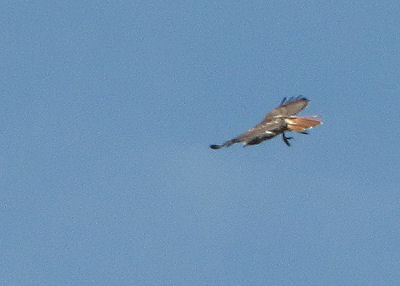 So, what I like best about these pictures is that you can clearly see why this is called the red tail hawk. That reddish color doesn't show up very well except when the sunlight flashes on it, and then... you can really see it! I put those two pictures next to each other because they are nearly alike, but not quite. Notice how in one shot the tail is spread wide? Those raptors with that blunt, wide tail are Buteo hawks. (Say BEW-tee-oh) Buteo jamaicensis is its scientific name. 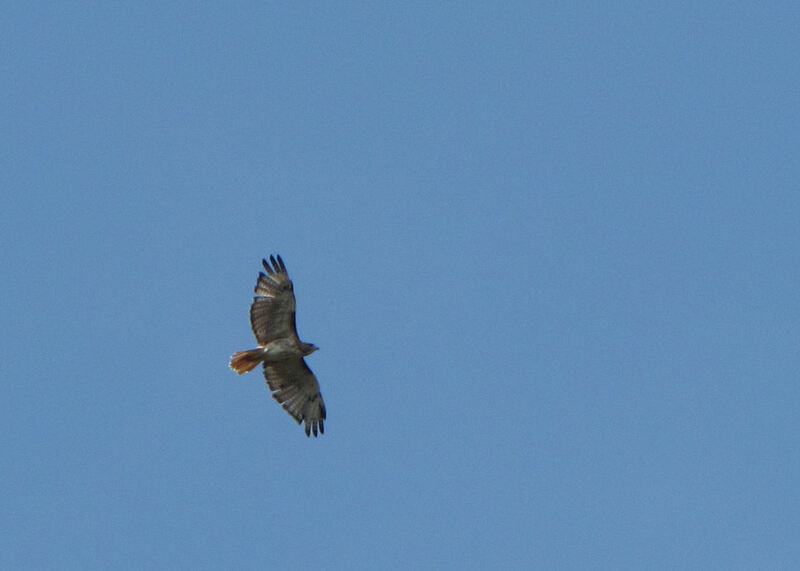 This is about the most common hawk there is. You are likely to see it almost anywhere in North America, particularly east of the Rockies. 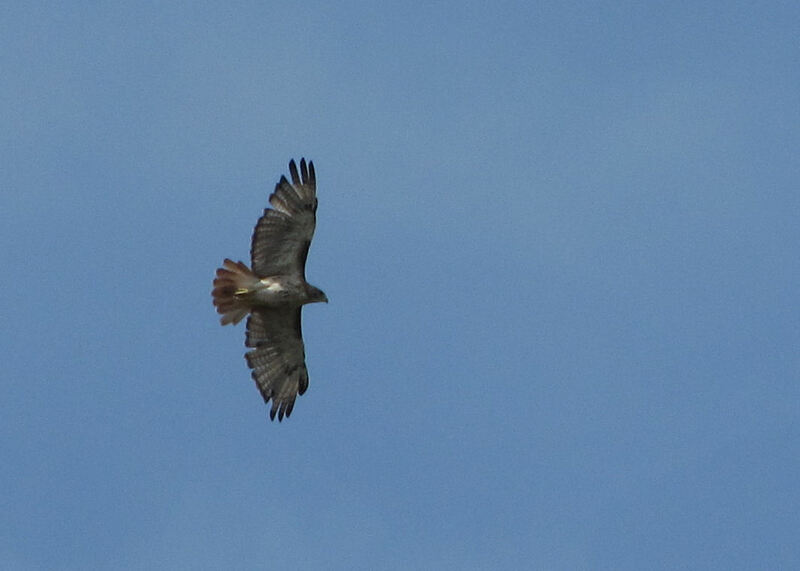 I like to think that this is "my" hawk... the same one returning each year. I have no clue if that's true, but sometimes fantasy is fine. Their call is a high screeching "kee-ee-eer" that starts higher and descends. It's kind of spooky, but easy to identify. My gear is packed. Tomorrow I will have to get the food together even though Loretta will be here. Thanks for all the well wishes in yesterday's comments, my friends! It was gray and rainy here all day. This post was supposed to be "Kitchenhenge," since it's the first day of fall. I'll have to hope that tomorrow's dawn isn't completely obscured. 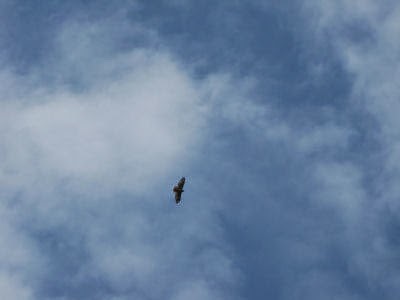 Instead I'll entice you to come back another day to see more of the hawk that loves to circle above my field. The new camera takes great pics against a clear sky (taken several days ago). I have to leave Friday morning for southern Ohio. That can't be fudged. I have two programs to give at the Trail Junction Festival in Milford, and hope to sell some books. Then I'm headed slightly east to do another 104 miles of the North Country Trail. On top of that, Loretta will be here all day Thursday, so I won't have much of that day to do anything. That leaves me tomorrow. So, this is where the difficulty lies in taking on the goal to finish the trail by the end of July 2010. I'm just on experience overload. I haven't had time to mentally process any of the other hikes from the summer, and now I'm headed off to do another one. This lack of processing leads me to a lack of preparation. A hike of 104 miles used to be a really big deal, setting off waves of map printing, food preparation, and anticipation. I love anticipation. But I've managed to kill that part of the hiking, and although I knew this would happen, and chose to do it, that still doesn't make me like it. Now, don't start worrying about me going on this hike. It's almost all road miles, and I'll be basecamped on a piece of private property. I don't have to have any dehydrated food. A basic idea of some menus would be good. I've picked out a few recipes that I want to try, and there are a couple of towns with grocery stores. I'll take the cooler and some camp cookware. My income these days comes from a variety of scattered odd jobs. The primary sources are writing, web site design and maintenance, and I recently started a job for a client to build a data base. That variety is generally what keeps me mentally and emotionally engaged, but right now I'm feeling more like on the edge of fractured. Oh yeah, I'm supposed to be selling books too. So... this should make for an interesting hike. I'll just run through my master list tomorrow which will ensure that I have all the gear I need. Then I'll try to pack some kitchen staples that I'd hate to have to buy on the road... a couple of onions, salt & pepper and other spices, etc. The program stuff stays packed and ready to go all the time. Oh yeah, I need the bike and all its accouterments for this hike too. I think my leg is healed and ready to go, but I'll be taking the ibuprofen just in case. Hopefully a string of quiet evenings alone will give me some time to sort the memories without making me too anxious over money I'm not making while I'm hiking. I hope to schedule some posts for while I'm gone, but it may not happen. I have no idea if I'll be able to get on line from the rural area where I'm headed. Well, tomorrow it will be either Kitchenhenge or more of the hawk. And it will definitely be packing day for me! See It's For You! for Loretta's previous visit. 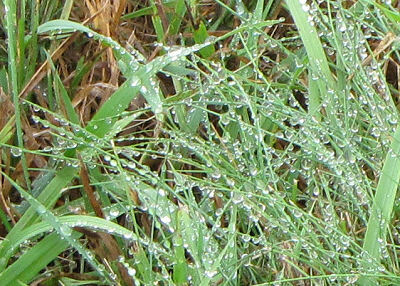 Early this morning we had some much needed rain- the first in three weeks. 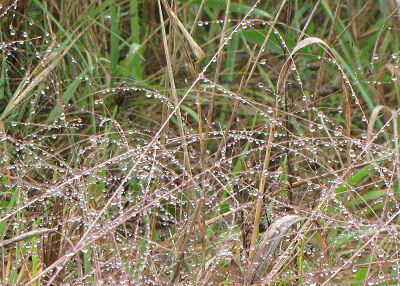 By mid-morning all that was left was damp ground, fresh air, and some lovely raindrops clinging to leaves. 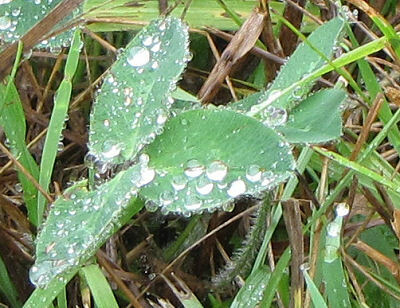 The clover leaves create platters for drops to collect. 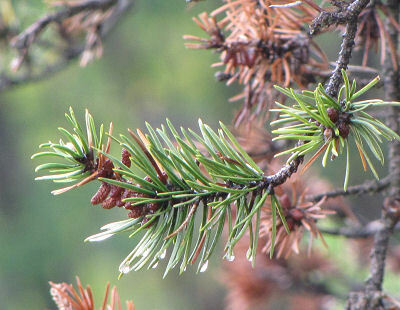 And the jackpine still held a few drips. Only occasionally do I wish that I were more of a morning person. Days like today are one of those. The air was cool but the sun bright and the space between the house and the aspen trees was filled with birds. 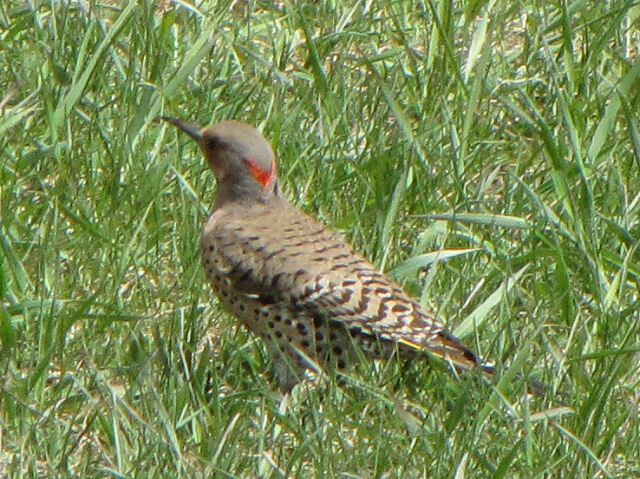 They were engaged in various occupations, notably a member of the woodpecker family was knocking loudly on the wood trim of our house. OK, I'm not so happy about that. 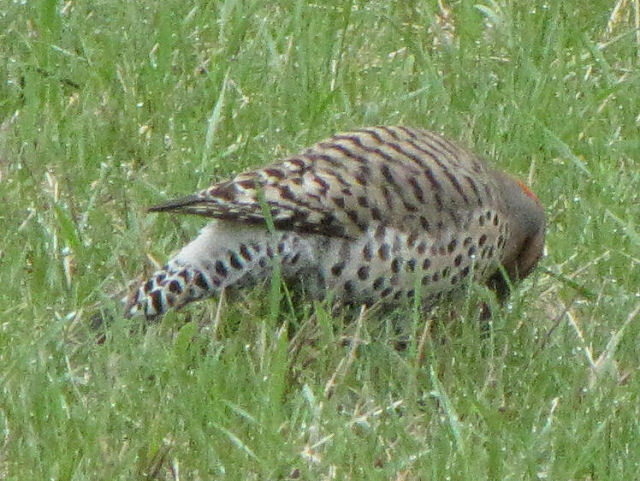 I saw and heard a house wren, sparrows, robins, starlings (sigh- not exactly a quality bird), the guilty woodpecker-- a downy, and the fairly regular morning visitor-- the yellow-shafted Flicker. I've been trying to get a picture of one all summer to show you. 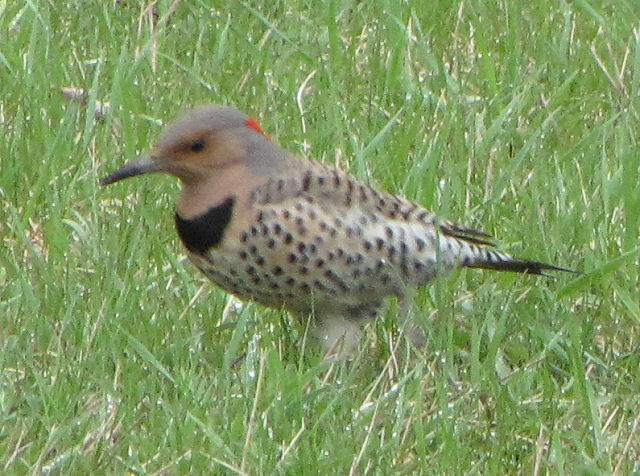 In fact, I thought that I had posted a rather poor picture of one this spring, but I guess I must have found something better to use the day I was thinking of it. So after I had been chasing the Flicker around the tree and lawn with my lens for a while, (how do the birds know where you are, and manage to keep a branch between you and the camera?) it became engrossed in banging some insects out of this rotting log, and I choose to bring this one in closer. You can see the red stripe around the back of its head, the long beak, and the light striping on its back. 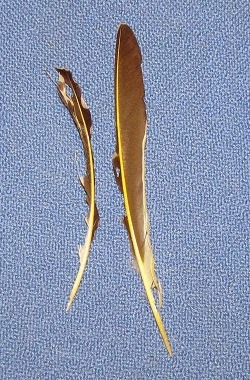 Finally, I took a picture of a couple of feathers that I had collected some time in the past. 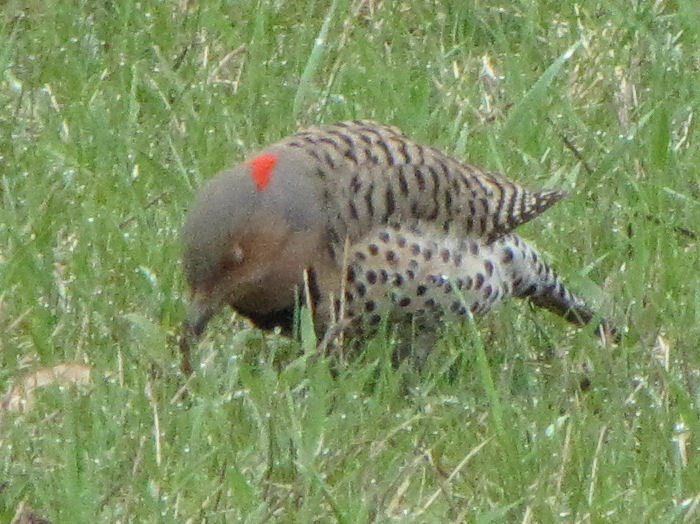 These show why this is called the "yellow-shafted" Flicker. There is a "red-shafted" variety found in the western US. For some reason I can't really explain I really just like the Flicker. Hope you do too! I'm not much of a grass expert. I've learned a little by "osmosis" but if I have time to spend on identifications that need a microscope, serious time, and heavy books, I prefer to spend it on sedges. 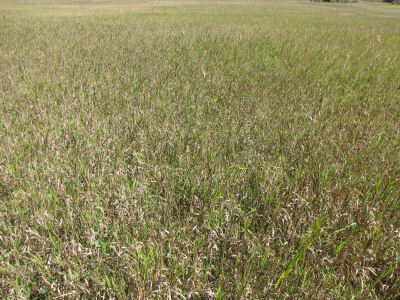 Nevertheless, there are a few easily identified grasses. This is one of them, and it is one of the handsomest, AND it grows in my field! It has two common names. 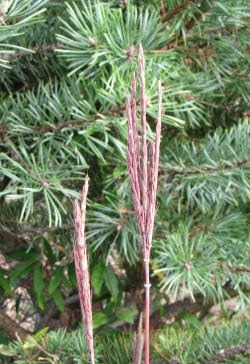 One is Big Bluestem. Yes, it's big. Not as big as some grasses, but often 6 feet tall. 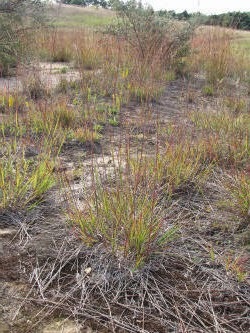 Mostly the word "big" is relative, because there is a similar grass called Little Bluestem. Is it blue? Well, not blue like the sky, but you can clearly tell that it is a purpleish color compared to the other grasses around it. In certain light angles it does look blue rather than green or brown. 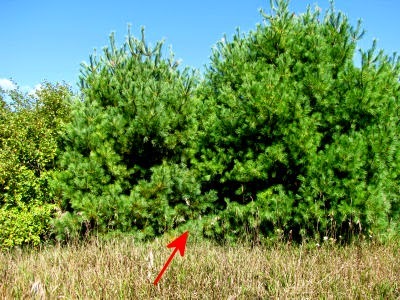 In this picture I've tried to show the head in contrast (that's a Scotch pine behind it). You can now see how it gets the name of Turkeyfoot. In fact if you now look at the first two pictures again, you may see lots of fowl-ish feet raised to the sky! And finally, in the picture below I tried to show what the whole plant looks like. Early in the season that circle of softer, light green grass at the base will start to grow. It doesn't look anything like the two features I just described. But once you get used to what to look for, it's easy to spot. Along about August, it will send up the tall stalks from each clump, and as the year ages, so will the color develop in the heads. 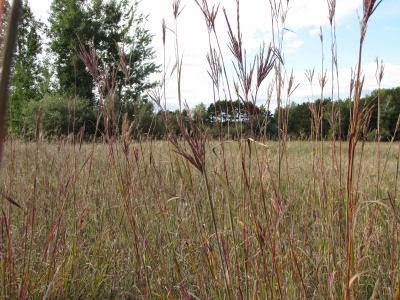 This is a native prairie grass. 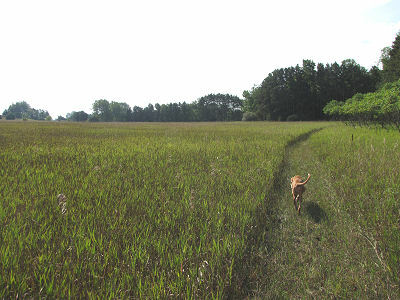 Although most of Michigan is not prairie, there are some pockets which are considered such. My backyard is not one of them, but my point is that it's not too unusual that it would decide to grow here. Lots of people pay money to get this grass onto their property. I just enjoy that it is happy here. Remember when I showed you the three kinds of sumac in my "kindgom?" They were Staghorn, Smooth, and Shining (or Winged). But only two of them were blooming then. 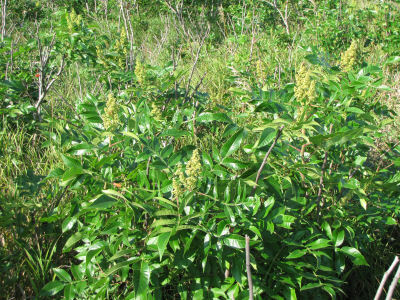 The Shining (Winged) Sumac has shiny, winged leaves, duh! You can see better pictures of the leaves at the earlier post (link below). But now they have their blooms too. 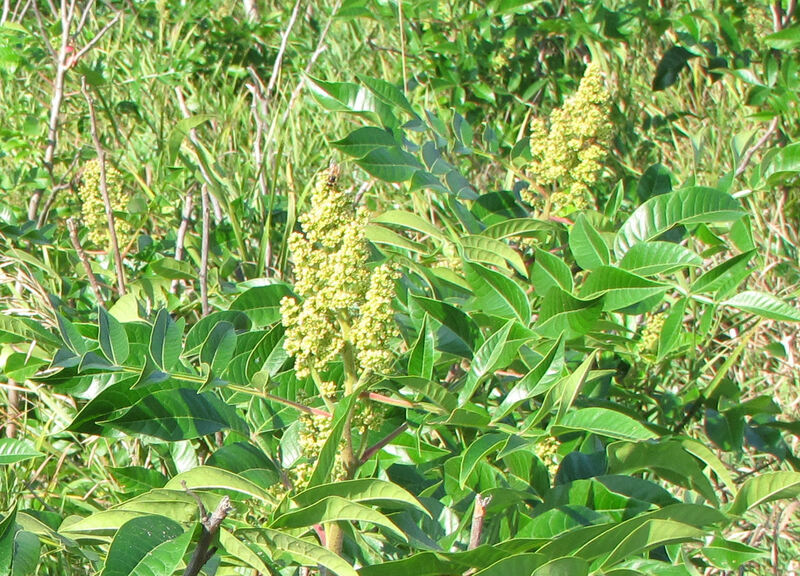 It may be later than usual because everything about my patch of Shining Sumac is late this year. Last winter the deer ate the tops off of almost every one of these young trees. They didn't get leaves until June! I Cleaned and Baked, Just for You! OK, I'm lying. I baked for Om and me. However, I did clean up the cabinet for you. I didn't want to take a picture for the blog with it as messy as it was looking. On the Minnesota hike I was fatally tempted by a new cookbook. Why, I'm not entirely sure, since I've all but abandoned kitchen duties here. All I can say is that I was suckered into it by how wonderful the restaurant is where it was for sale. The location is called "Betty's Pies." It's just north of Two Harbors, Minnesota. If you are ever traveling up the North Shore, don't miss the opportunity to eat here. Of course their specialty is pies, but you won't be disappointed with their sandwiches either! We always eat there when we are in the area. So, with "fruits of the forest" dancing on the backs of my eyeballs, I bought the book, full of recipes from the many successful decades of Betty's Pies. What was I thinking! Om has been startlingly disciplined on his restricted diet. I sure don't need to bake desserts when I am the one who needs to eat the whole thing... because... I will, of course. 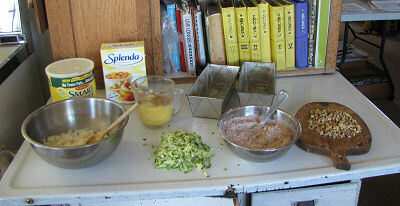 And yet, there in the book was a recipe called "Chocolate Zucchini Bread," and it's summer. You know that means that there was zucchini in the refrigerator. 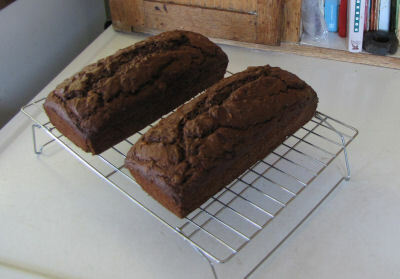 So last weekend I used our "standard" adaptations to make recipes healthier and made the two loaves the recipe produces. WELL! It was SO good, more like cake than bread, that we had to slice it up, package and freeze most of it so that we could be disciplined enough to ration ourselves. I also went for a 10-mile bike ride today. I've been working up to this because my hike at the end of the month will require me to spot myself with my car and bike each hiking day. I say "working up," because you may recall that I came home with a stress fracture. It seems to be healed! (holding breath and being good) My leg wasn't sore today, but I iced it for a while anyway, just as a precaution. Next time, I'm going to ride 10 miles, but more on dirt roads. I was mostly on pavement today. OK, compared to fairy tales, this post isn't too exciting. But it's something I'm very happy about, and hey, it's MY quality day! Trees seem to grow very slowly, and I would like my "kingdom" to be more wooded than it is. But sometimes there is proof that the trees grow faster than we realize. In the top picture there are two white pine trees. 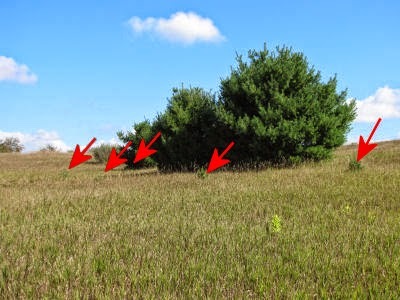 Through the beginning of last summer I was mowing a trail between those two trees, where I've put a red arrow. But at the end of 2008 I knew that I'd need to re-route the trail; it just wasn't fun to push between those trees any more. And look at them this week! It would be really difficult to force your way between them now. 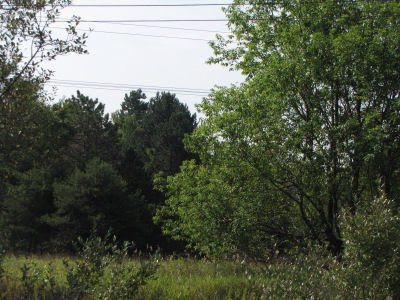 Those two trees seeded themselves there, children of the grove of white pines on the top of the hill on the neighboring property. The picture below really makes me happy! The tall white pines are ones that I planted there about 20 years ago. Five of those have lived and are all about the same size, maybe 20-25 feet tall. But then about six years ago it was a really good year for pine cones to sprout and I transplanted 14 tiny white pines from the grove mentioned above to join the larger ones seen here. Only about 9 of those are still alive. But take a look at the red arrows here! 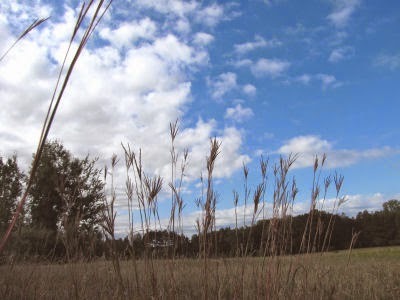 For the first time, 5 of those tiny baby trees are tall enough to be seen above the field grasses. That really makes me feel very happy. They say that those who plant trees do so for the next generation. I know that these won't be a stately grove till we are long done with this property, but I'm just happy that they have succeeded as well as they have. I've found wild turkeys nesting beneath them, and I just like to touch their soft needles as I walk by. What an amazing piece of luck! With the help of Maggie to rustle the grasses, I transformed a praying mantis into a fairy while I had the camera turned on and pointed in the right place. Now, this is not a great picture, but it's a little better than snaps of the Loch Ness Monster or Sasquatch. Do you see it? I'll help you a little bit. OK, I know it's lousy photography, but at least you know I didn't make up the entire fairy story! The fairies were still there today! I saw two more flying above the field. Yet, it is the sad truth that when the fairies come to rest it turns out that they are indeed the Tyrannosaurus Rex of the insect world. Who guessed it's identity? 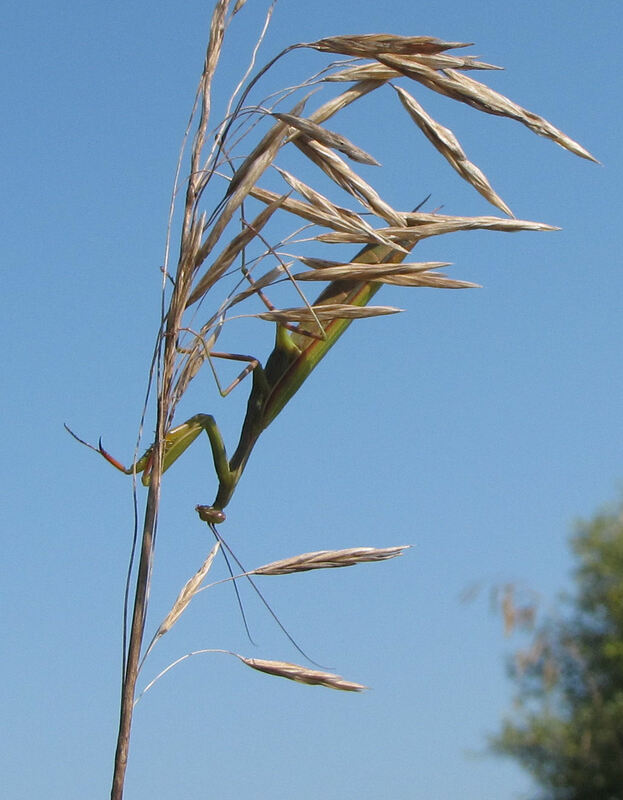 I sure did not know that when a praying mantis flies that the undersides of its wings are white! 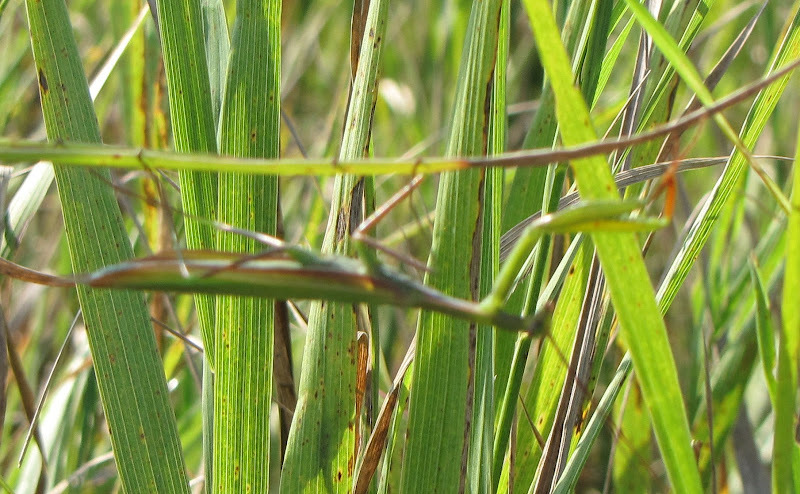 Praying mantises are large insects, three or more inches long. They are vicious predators in the insect world. Larger species not native to the United States even eat small frogs and lizards. AND the female eats the male after mating! They will be happy to pinch or bite your fingers if you pick them up too. The other choice I gave you yesterday was a Katydid. 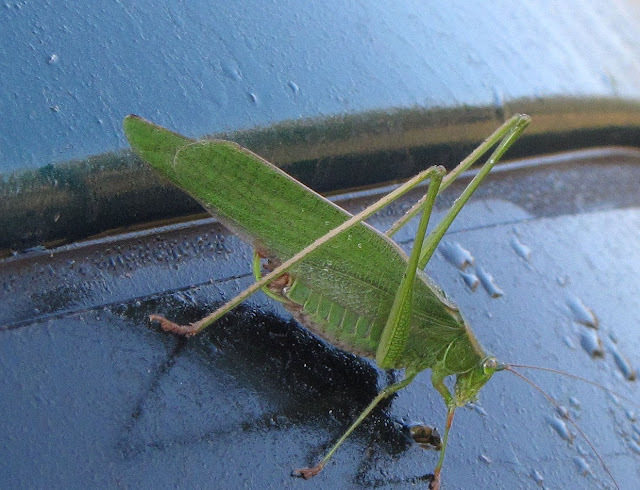 Katydid's are actually related to crickets. They can pinch or bite, but rarely do. I pick them up almost whenever I see them. They are a wonderful part of my childhood memories, even if they aren't fairies. Their name comes from the sound the males make by stridulation- rubbing together of their wings. I remember many summer evenings with the calls of "katy-did, katy-did-did-did" filtering through the screen door of the kitchen. PS- If you are at all interested in web advertising, would you hop over to Just Throw Money and take the poll about what you think ads on a blog should be worth. Four days ago I was using the riding lawnmower to mow my walking trails through the fields near my house. As I stirred up the tall grasses many insects were flying around and trying to get out of the way. Suddenly, a large, slim fairy, pale and illuminated, as if it somehow was able to surround itself with moonlight even in mid-afternoon, fluttered away. 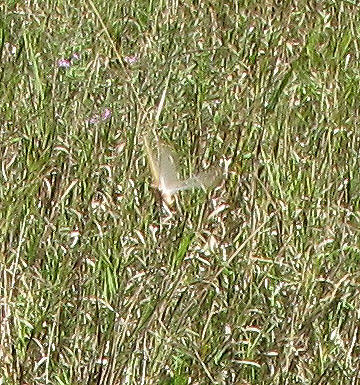 Its wings were long, and it scurried through the warm air, then dropped into the grass, disappearing. As I continued mowing, more and more fairies sprang away from my noisy and disturbing activity. Each was that eerie pale white, occasionally flashing gold edges from their backs and wings, as if they flickered between sunlight and moonlight. Who were these mystical, enchanting visitors to my field? I'd never seen them before. The next day I went walking with my camera, thinking that I would capture a fairy in pixel dust. Wrong! You already knew that you can't capture fairies, right? Well, I did see several of them, but when I took a picture, this is what showed up. So, I found out that you can't take a picture of a fairy! The next day I saw more fairies, and the next day too. Today I saw one more. I did manage to follow several of the little teasers to where they had alighted. But each time I found the landing place, I discovered that the white fairy had disappeared and left a green monster in its place. Which green monster do you think the fairy became? Tomorrow I'll tell all! The Secret of the Clammy Ground-Cherry -- Revealed! Here is the seed pod, matured from its tiny beginnings in July. See it? Maybe you think that it looks like the ornamental plants called "Chinese Lantern Plant." And that would make you very observant! They are close cousins. This plant is Physalis heterophylla, and the ornamental is Physalis alkekengi. Note on this plant that the seed pod, really just an inflated calyx (the small leaves that grown "behind" the flower), turns golden as it ages. This makes it really look like a little lantern! But this is only half the secret. Here we are! Inside each one of those seed pods is one single little "cherry." Note that even though the pod I've broken open here is green that the fruit has become a dull gold. If you open the pod and find a golden cherry you are in for a special treat... they are edible! They have sweet-tart sort of taste, sort of like a kiwi, but unique in its own way. The fruits are sticky, which may be where the "clammy" part of the name comes from. I just like to eat them as I find them while walking. But they can be collected. A friend once made relish from the fruits that was good served with meat. There are about 200 mammals in North America. Although I would certainly never say that I know all of them, I thought that I at least would recognize any from the Northeast or Northern Midwest. Wrong! 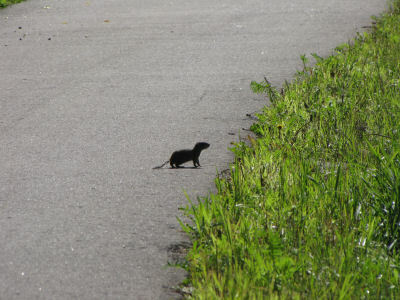 Here's a little furball that we saw on the Mesabi Trail one day. Appears to be some kind of rodent. 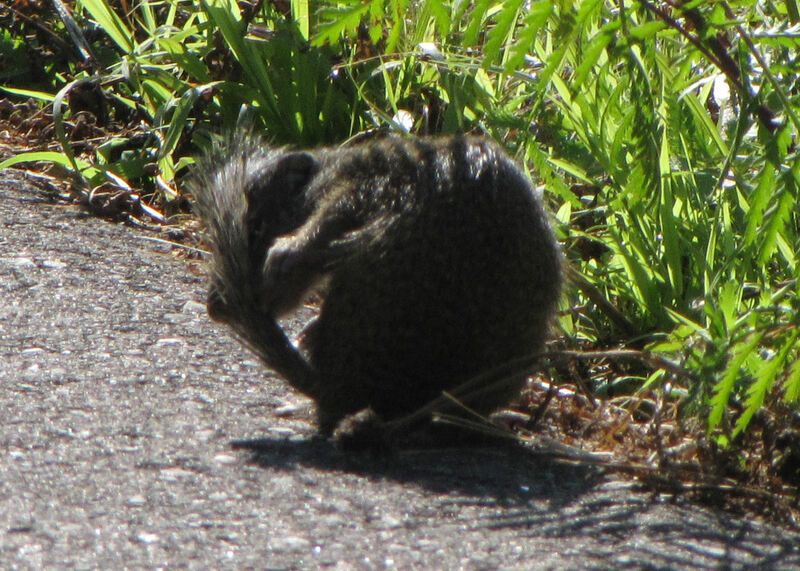 OK... holds its tail out behind it, not up, when moving (Chipmunks run with their tails up). 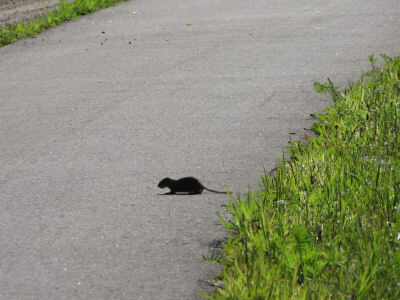 There are more rodents than any other kind of mammal. 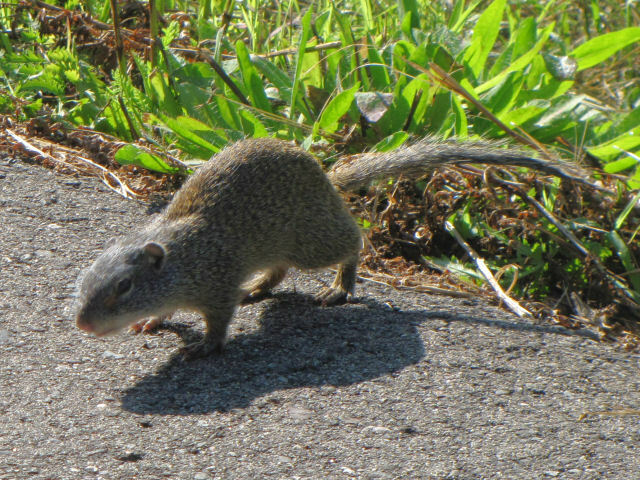 Wonder what the heck this is... some kind of ground squirrel? "Pardon me, this is important"
"Actually, it's a little embarrassing... I mean, how would you like to have to clean your tail in public?" Well, you can believe that I really was eager to look this one up when I got home! 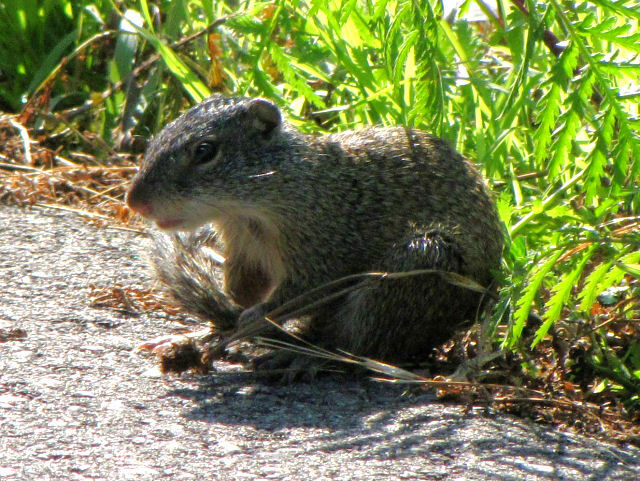 Seems this is a Richardson's Ground Squirrel, Spermophilus richardsonii, often called a Flickertail. 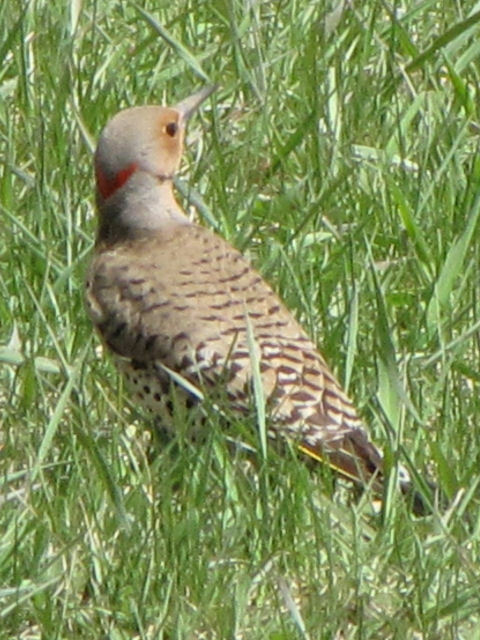 It is native to short grass prairie. In fact, North Dakota's nickname is the Flickertail State! (I'm embarrassed to say that I thought that was referring to a bird.) So, we saw this in Minnesota, on the Mesabi Trail. 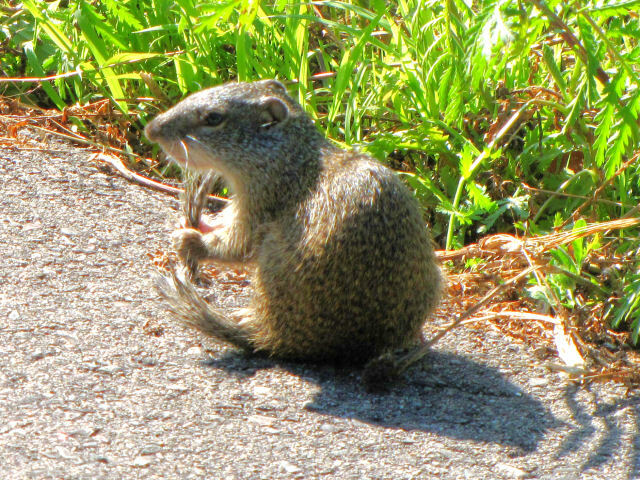 Supposedly they act more like a prairie dog than like other ground squirrels, and they flick their tails a lot... thus "flickertail." Well, I'm always happy when I'm learning something new about the outdoors, so this was a 5-star day on the trail!